Did you miss me? 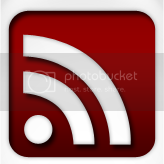 I certainly missed blogging here during the past few weeks! Though I had some fabulous guest bloggers help me out in the interim, it's good to get back to work on my baby. I just have to keep reminding myself that I have to take it slowly at first. As most of you know, I moved - rather unexpectedly - to a different apartment in my building (for those of you who really want to know all the details behind my decision, you can check out my post on my other blog). It was one of the best moves I've made in a long time, and I am quite happy settling in to a place that feels brighter, happier, and safer than where I was before. The only sucky part was that I had a really strict deadline and almost zero help or preparation to get said move accomplished, so it was probably the most difficult move I've ever had to do. One thing's knowing that you're going to move and having time to pack and get rid of excess junk; another is having to move all that crap with you in less than a week with no boxes or sweet friends to help you (and who can blame them, considering there was hardly any notice!). So up & down the stairs I trudged, carrying whatever I could in my hands, making sure not to carry too much so I wouldn't lose my balance and fall (which is something I'd probably do, I'm so darned accident-prone). Before and after work I'd do this, falling into bed exhausted at completely inexcusable hours, freaking out more & more each day as my move-out deadline approached. Gah. And so, in traditional form whenever stress levels get too high for me, my body shut down. Again, I won't go into the details of what I'm dealing with, but let's just say I'm in quite a bit of pain due to the neuralgia I'm experiencing, and have a few more weeks of recovery time before I'm back to normal. So as happy as I was to get everything moved in on time, my body decided that settling in was going to take a spot on the back burner because health was more important. I guess I can't disagree with it; I just wished it would let me know in advance before it freaks out in major ways. The good news is that I'm on the mend and have slowly gained enough strength to get some work done around here. I've created a small workspace so that I can blog again, and have learned to navigate my much tinier, but way cuter new kitchen. The bad news is that I have to rein in my lofty new recipe ideas for awhile, so tonight's recipe is super simple. But as you all know, in my world, super simple can still = super delicious. I was inspired to make the following recipe for a number of reasons, namely: A) I wanted a mushroom & olive pizza but didn't want to spend $30+ on delivery, and B) I needed to do something with my big ol' tube of polenta. In the spirit of my dessert shots, which pack all the sweet joy of dessert into tiny little shot glasses to minimize the guilt factor, I decided to turn my pizza craving into something equally tiny & less evil. It's not my usual made-completely-from-scratch work, but it does a great job at making a quick, tasty meal without too much effort. NOTE: Mushrooms & olives just happen to be my favorite pizza toppings, so if yours differ, by all means, use whatever toppings you enjoy! Prepare the "pizza sauce" by combining all ingredients in a small saucepan and cooking over medium low heat until heated through (about 4-5 minutes). Remove from heat & set aside. Cut the polenta into 1/2" thick slices. Season both sides of each slice very lightly with salt & pepper and set aside. Heat a large skillet over medium heat and add the olive oil. When oil is heated through, arrange the polenta slices in the skillet and pan-fry for about 3 minutes on each side, or until slightly golden brown & crispy to the touch. Remove the polenta from the skillet and place on a paper towel-lined plate to drain the excess oil. 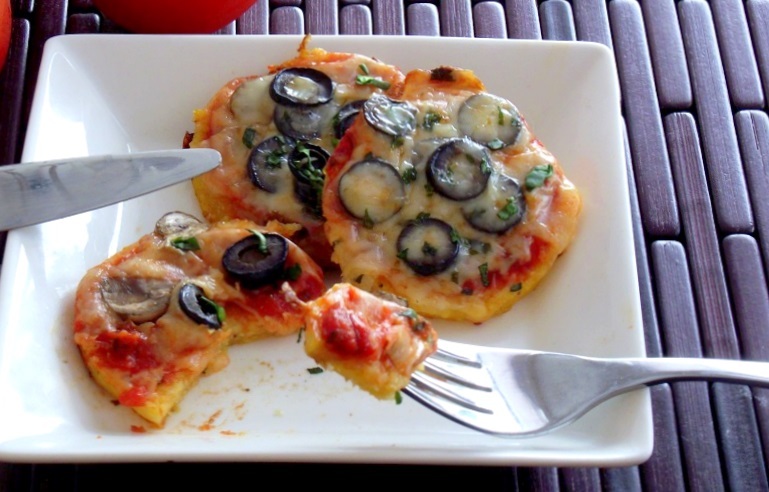 Add about a teaspoon of sauce to each polenta slice, top with a teaspoon or so of shredded cheese, then add the olives & mushrooms. 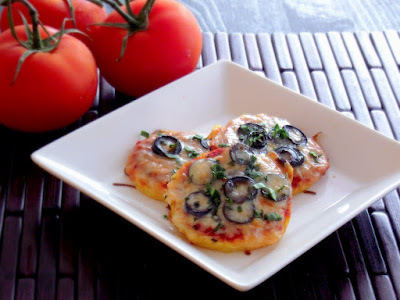 Return the mini pizzas to the skillet and cover, cooking for another 2-3 minutes, or until the cheese has melted. Garnish with fresh chopped basil, serve with a nice salad, and enjoy! Polenta as a pizza base - brilliant. Not only is this dish cost effective, it also falls into the category of Meatless Monday. I love my proteins, but this would sway me in a snap! very cool!! I'm glad your move is behind you, and all good now, or so it sounds? Your story definitely reminded me of all the college moves I did back in the day. I'm glad your new place is much better! I LOVE these pizzas. Of course, I had a soft spot for pizza. It's the American roots in me. Keep the pizzas coming! Cheers. Wow that's fantastic -I've never thought of using polenta as a pizza base before. How yummy! Thanks for sharing; can't wait to try this! That is cool. This is a must try. 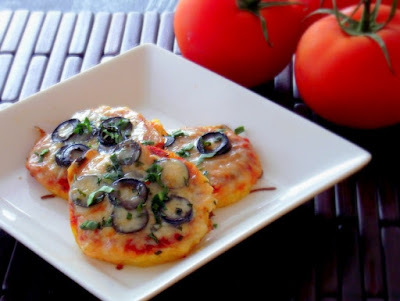 I was thinking about making polenta pizza for dinner this weekend, and now I'm thinking I'm going to try mini-pizzas. Thanks for the great tip and super-simple recipe. A Gluten intolerant gals wild dream!!! You ROCK!